Please keep answers short and simple. We want a feel for who you are, where you are at currently, and how we can support you! How did you hear about The Red Word? How much energy have you put into your art over the last year? What level would you consider yourself to be at? What level would you like to reach? My art is my hobby Career & Beyond! How much energy are you willing to put in to get there? Not Available Lets do this! Are you willing to invest in yourself financially to get there? My money blocks hold me back I know I am worth it! What is your form of expression? Singing, music, acting, visual art. What genre, scene ect. What are your main goals pertaining to your art? What has been the biggest thing holding you back from reaching your goals? What do you think would take you to the next level? Most recent completed project and when did you complete it? ie. written, verbal, other? Do you have a hard or easy time receiving criticism or feedback? Artistic expression, the desire to be heard, fame, money, power, desire to heal, ect? What have you invested into your art? Financial investments, time, lessons, studio space, ect. What do you have going on over the next 6-7 months? Travel plans, education, life events? What would be your dream project to actualize by the end of this year? What is the end goal you would love to accomplish this lifetime? Have you ever been a part of an artist collective? What value do you bring to the collective? Relationships with labels, business skills, graphic design, large network, ect? Have you participated in any artistic programs, training, or coaching? If yes, where/when and with who? What drew you in about The Red Word? And what you would hope to get out of it? If you are not able to upload examples, please send them via email to missrubychase@gmail.com with “Red Word Application example” as the subject and include your name in the email. 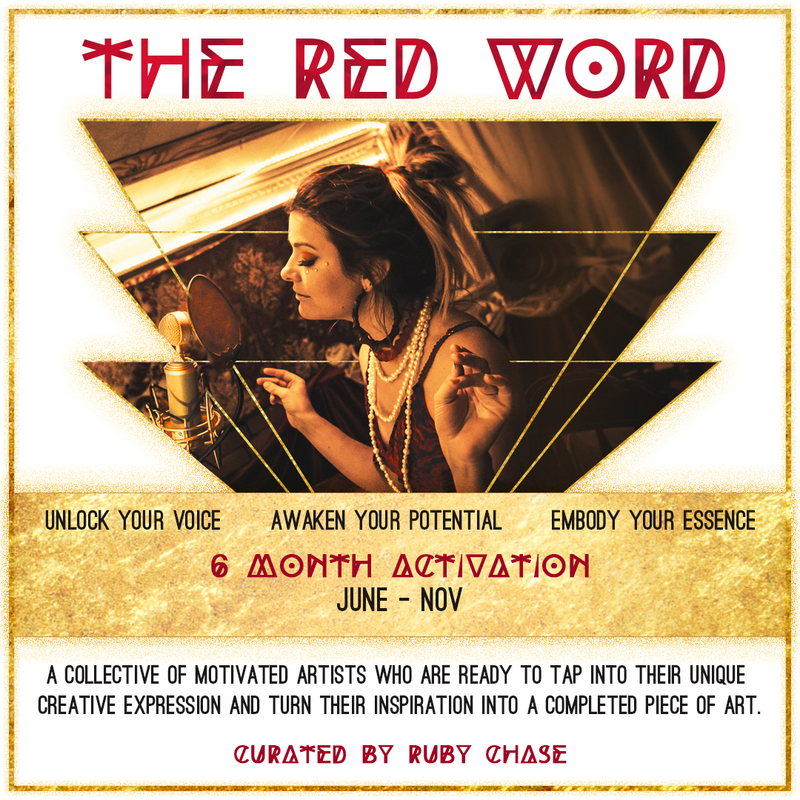 The Red Word is a 6 month training designed to unlock your voice, tap into your creative power and develop a strong foundation of a healthy lifestyle. This is a prerequisite program to be in the artist collective. By submitting this form you understand that this will be an investment toward your future.